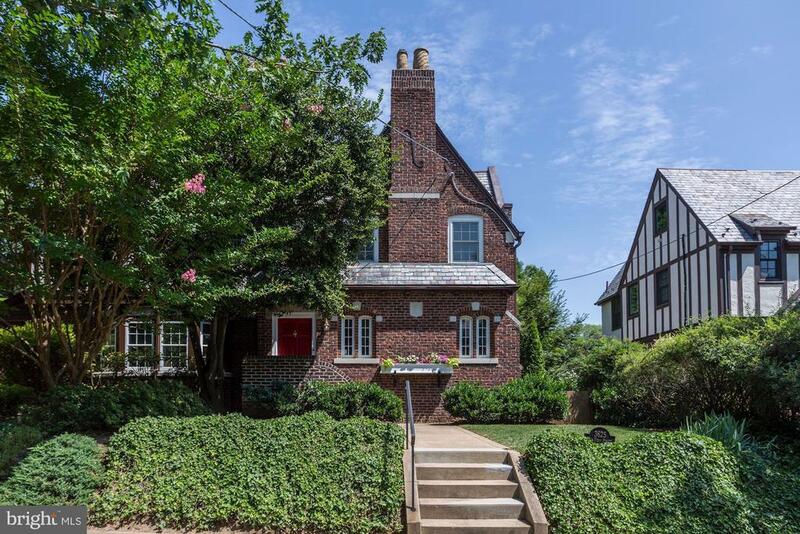 With easy access to Metro, Cathedral Commons, shopping, dining, and parks, this elegant semi-detached Tudor in North Cleveland Park with garage parking was designed by George Santmyers, one of DCs leading designers of townhomes and apartment buildings. The light filled, freshly painted interior features newly refinished hardwood floors and recessed lighting, and welcomes with a foyer, formal living room with a fireplace, formal dining room and a renovated kitchen with stainless appliances including a Bosch 5 burner gas cooktop, double wall convection ovens, a 34 bottle wine refrigerator, and a built-in banquette surrounded by windows ideal for dining and watching TV. The kitchen overlooks a beautiful garden and fountain perfect for outdoor entertaining. Three bedrooms and two renovated baths, including a master suite with en-suite full bath, and top of the line Andersen replacement windows are featured on the upper level. The lower level includes a studio in-law apartment opening on the garden, a laundry area and storage space.